Many would have seen this coming. Last March, Zest Air and AirAsia Philippines announced a strategic partnership to further their strength in the increasingly competitive local aviation industry currently led by Cebu Pacific. Part of the deal is the acquisition of 40% ownership of Zest Air by AirAsia. And we are now starting to see the progress of that deal. 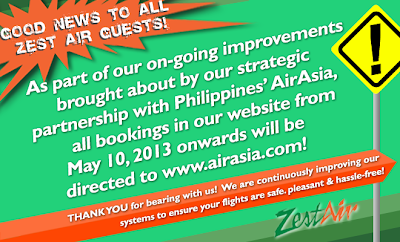 Starting May 10, 2013 all Zest Air flights will now be booked at airasia.com. Instead of booking in two separate websites, Zest Air and AirAsia customer just have to go to one site. A unified system is of course a more efficient way to operate a business. 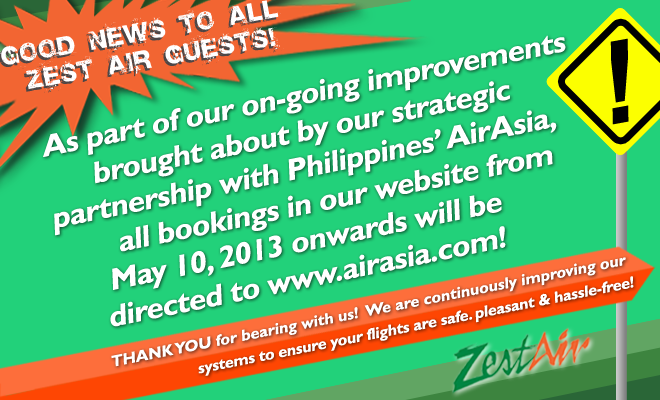 We can therefore expect that starting May 10 all visitors of flyzest.com will be redirected to airasia.com/ph. Efficient Operation Means Better Customer Service? I'm just hoping that this latest development will dramatically improve Zest Air's customer service. I was referring to services that should be given to the customers when flights were cancelled, delayed or rescheduled. From my personal experience, they need a lot of improvement in this regard. Zest Air is a local low-cost carrier that operates in Ninoy Aquino International Airport Terminal 4. They serve many domestic destinations as well as selected&nbsp;international&nbsp;routes in the region of Asia. The&nbsp;company&nbsp;was originally called Asian Spirit when it was founded in 1995. AirAsia Philippines is the local subsidiary of Air Asia, the largest low-cost airline in Asia based in Malaysia. AirAsia Philippines operates in the Disodado Macapagal International Airport in Clark, Pampanga. They currently serve several domestic and international flights from Clark terminal. In March 2013, Zest Air and Air Asia announced a strategic partnership where AirAsia will acquire 40% stake in Zest Air. The purpose of the deal is to better position the two companies in the competitive local aviation industry. As much as I love reading your posts, please try to check your grammar and orthography the next time you write. I must tell you, it is really disturbing to the eyes and mind, if you know what I mean. Thank you. sir/maam., naka booking po kami sa zestair june 3 , 2013 cebu-puerto princesa and june 10 , 2013 puerto princesa-cebu.. my panibagong ticket po ba yun.. anu po gagawin namin dun.. tnx po sa concern. Unless zest air contacted you personally about a particular action required on your part, you don't need to do anything.